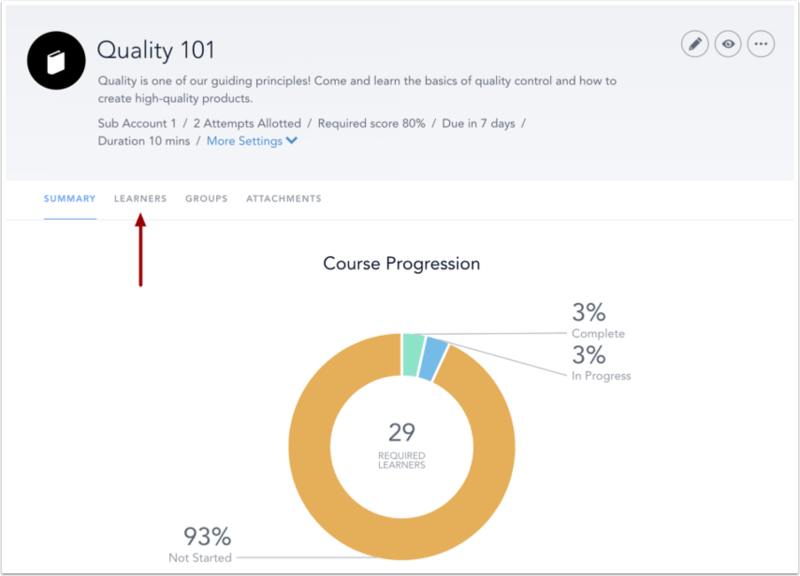 In the Learners tab of the course details page, you can edit each learner's progress. In the Global Navigation menu, click the Application Switcher icon , then click the Author option . In the Courses page, click the name of a course. To view individual learners, click the Learners tab. The Learners tab shows all learners enrolled in your course. To edit the progress of a learner's enrollment, click the Progress icon . To mark a learner's progress as complete, click the Mark Complete button . To reset a learner's progress, click the Reset Learner button . Previous Topic:How do I view course details? Next Topic:How do I add a course? Table of Contents > Manage Courses > How do I edit a learner's course progress?